Oozing grand simplicity, the Atlas Globe Light Table Lamp is statement lighting for your side tables, coffee tables and bedside tables. Featuring a luxe black and brass band with a circular Atlas Globe glass shade this beautiful light feature will flow seamlessly with your interior style. Please note, this beautiful Atlas Globe Table Lamp With Black & Brass Base has been handmade for you and so will have the expected imperfections and variations of a handmade product. The Atlas Globe Table measures 29cm in height x 10cm in width. 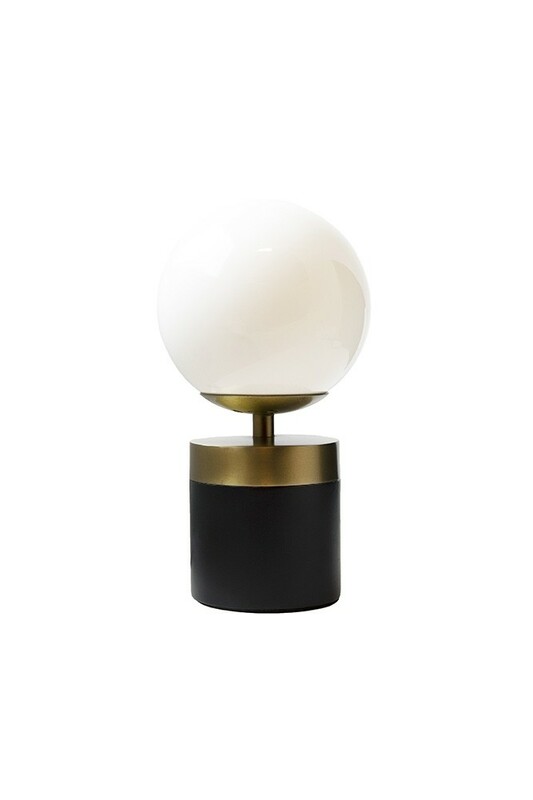 Super striking and beautiful we think you will love the Atlas Globe Table Light With Black & Brass Base because its unique lighting that will add luxe glamour to your home. 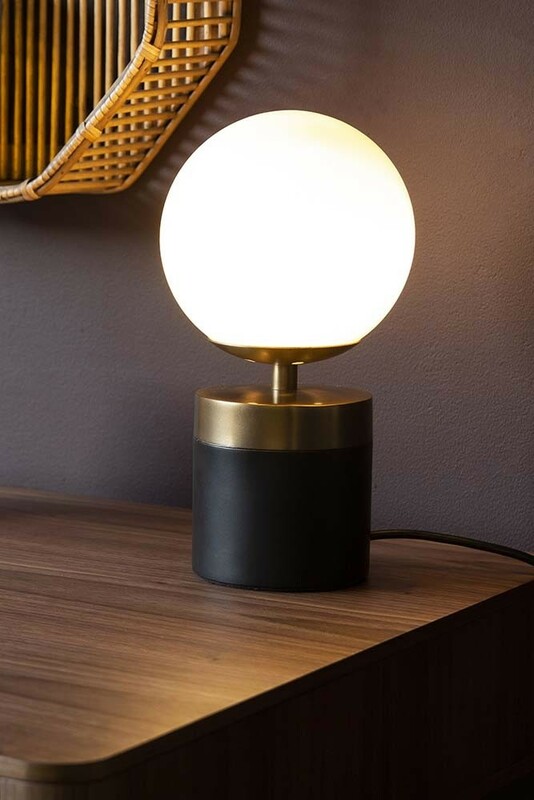 A great choice for those of you who would describe your interior style as contemporary, sophisticated, minimalist or stylish we think that the Globe Table Light is a monochrome table light that will complement your décor. The Art Deco Style Atlas Globe Table Lamp With a Black Base and Brass Band is part of our new collection of table lights, wall lights and ceiling lights. So why not complete the set and check out our amazing selection of art deco lighting?! 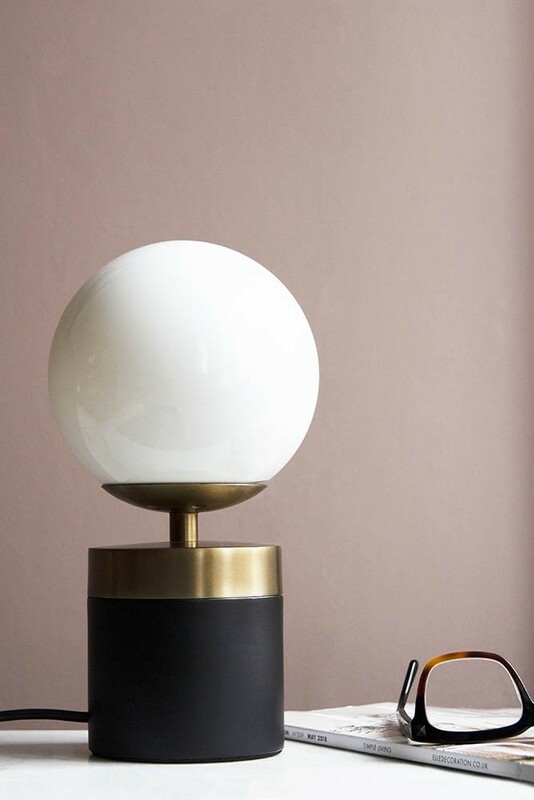 A particularly great bedside table light the Atlas Globe creates a warm glow in your bedroom, which is the perfect mood lighting for creating a luxury, relaxing and hotel style bedroom. Alternatively, this beautiful table light is a great feature lighting choice for your living room creating an ambient relaxed feeling in your social spaces.